Notice prohibiting drift net fishing for salmon or trout on River Blackwater, Co. Waterford. Poaching was a major issue for the British authorities and much police time was taken up with containing the problem. 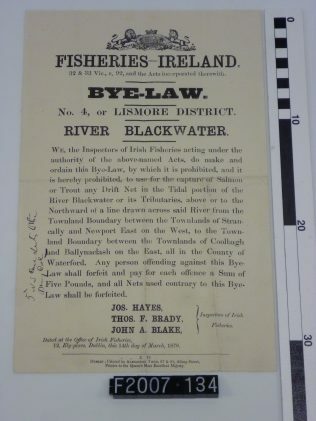 Dating from March 1878, this notice prohibits “for the capture of Salmon or Trout any Drift Net in the Tidal portion of the River Blackwater or its Tributaries”. This object will be displayed in an exhibition marking 200 years of policing in Ireland in 2014.